In my view, there are few technology companies that are as easy to understand as Docusign (many people have used Docusign to sign simple online agreements), yet still have broad and far-ranging use cases. We are probably most familiar with Docusign's use case in real estate, where modern brokers like Redfin (RDFN) use Docusign exclusively to execute purchase and sale contracts. Docusign's capabilities also extend far into other industries such as healthcare and finance. At the heart of it, every business deals with agreements and contracts - and indeed, DocuSign just packaged its core offerings under a new brand called the Docusign Agreement Cloud, which includes more than a dozen of its products plus new modules like Docusign Click, which allows for a one-click interface to capture customer acceptance. In light of a bevy of strong product launches and a strong exit to Q4, Docusign issued incredibly strong guidance for the coming year. Its guidance range for FY19 calls for $910-$915 million in revenue, representing a growth range of 30-31% y/y versus FY18 revenues of $701 million. Note that Wall Street had originally pencilled in a far less optimistic outlook for FY19, calling instead for $861.6 million in revenues (just 23% y/y). Note also that this revenue guidance is also accompanied by a strong forecast for billings of $1.01-$1.03 billion, representing 27% y/y growth at the midpoint versus this year’s billings of $801.4 million. As a reminder, SaaS investors should look to billings growth rates keeping pace with revenue growth rates as a forward-looking indicator of future growth potential. Docusign also expects to retain its sky-high gross margin of 78-80% (on a pro forma basis), as compared to 80% this year. At present, Docusign trades at a market cap of $9.62 billion. Thanks to its IPO proceeds as well as the fact that Docusign is also tremendously FCF-profitable, the company is also sitting on $933.2 million of cash - as well as holding $438.9 million of convertible debt. 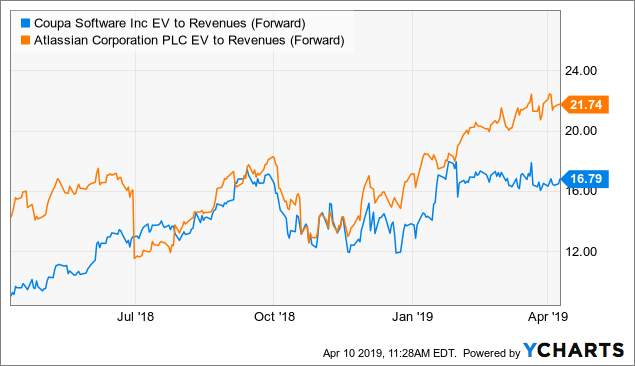 If we net off this net cash position of $494.3 million from Docusign’s market cap, we arrive at an enterprise value of $9.18 billion, representing a valuation multiple of 10.0x EV/FY19 revenues. 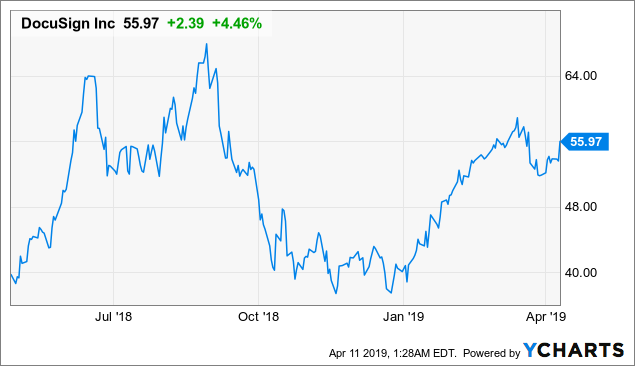 In my view, an FCF-positive and quickly growing technology company like Docusign that has broad use cases and entry points across a multitude of industries is worth a valuation premium. My year-end price target on the stock is $66, representing 12x EV/FY19 revenues and ~20% upside from current levels. Keep a close eye for an entry point into this fantastic SaaS name, especially with its strong outlook for the coming year that beat Wall Street’s growth targets by seven points. Revenues grew 34% y/y to $199.7 million, smashing Wall Street’s expectations of $148.9 million (+30% y/y) by a strong four-point margin. Billings also clocked in at $262.4 million, representing 31% y/y growth. 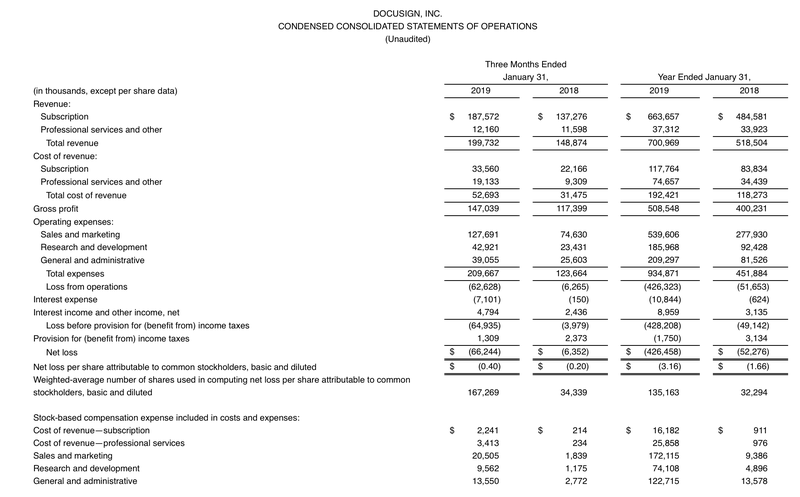 Though Docusign’s billings growth rate lagged three points behind revenue growth, the fact that the dollar value of billings came in approximately one-third higher than revenues indicates that Docusign is still building up its deferred revenue base (essentially a funnel for future recognizable revenues). The company also added 22k net new customers in the quarter since Q3. 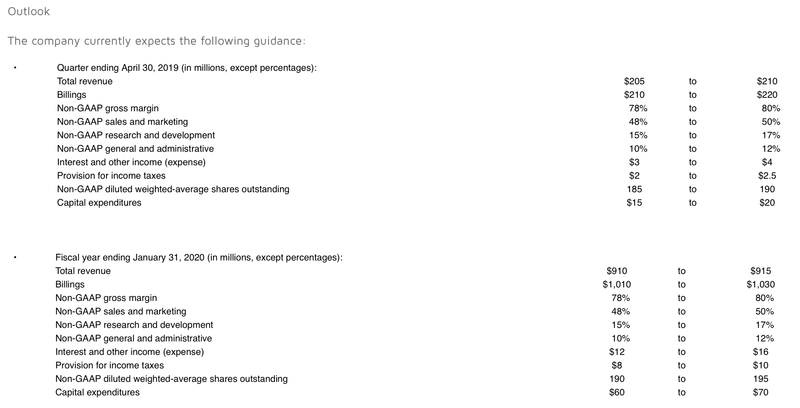 Note also that Docusign’s revenue mix improved this quarter as well. Most SaaS companies find it necessary to offer a limited stream of professional services to help clients onboard, but these services are often performed at or just above cost. In Docusign’s case, the cost to deliver professional services is almost double what Docusign earns in revenues from them. As such, the fact that Docusign’s subscription revenues grew 37% y/y while professional services were essentially flat at 5% y/y is a huge tailwind from a margin perspective. Docusign’s subscription revenue mix this quarter was 93.9%, a 170bps bump versus 92.2% in the year-ago quarter. Over time, as professional services costs stabilize, Docusign should be able to drive stronger gross margins due to its heavier subscription mix. Though Docusign's losses widened this quarter due primarily to a 71% y/y lift in sales and marketing expenses, the company's pro forma EPS of -$0.06 showed substantial upside to Wall Street's estimates of -$0.11. Just last week, we announced DocuSign for Salesforce Essentials. 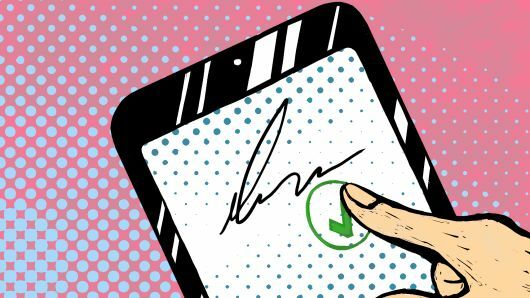 It's the version of our e-signature technology designed specifically for use with Salesforce's product for small businesses. We expect Gen for Salesforce to provide a great new way for customers to use DocuSign and Salesforce together to accelerate the preparation from their agreement." Given that Salesforce has one of the best-oiled enterprise sales machines in the SaaS industry, a cross-selling partnership with Salesforce provides an excellent opportunity to drive organic growth into new markets and channels. 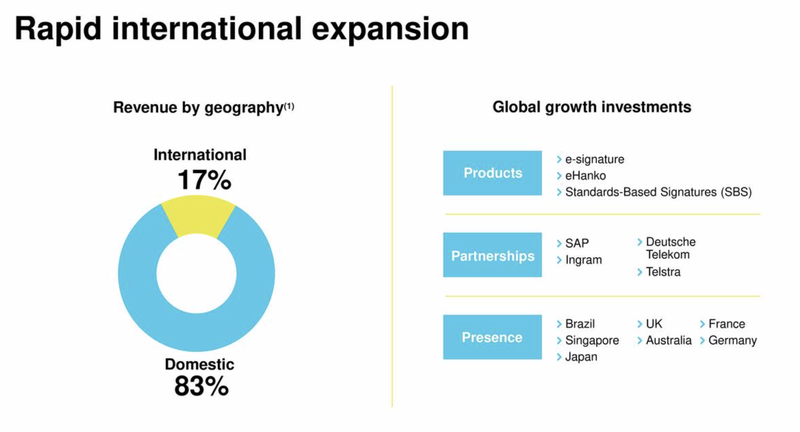 Partnerships with foreign blue-chip software giants like SAP (SAP), similar to the partnership with Salesforce domestically, should also help to accelerate Docusign's push into overseas markets. The bottom line on Docusign: this is a company with a massive $25 billion market opportunity spanning multiple industry verticals and across a variety of products aimed at simplifying one of the core elements of business: multi-party agreements. Docusign has proven itself to be a growth machine - even as it stretches toward a $1 billion annualized revenue run rate, the company is still guiding to ~30% y/y revenue growth. There are, of course, risks to Docusign's growth story. Key among these risks is Adobe (ADBE), which in recent years has put out a competing product called Adobe Sign. Adobe's own Document Cloud (the product family into which Adobe Sign belongs) has been an important source of growth as sales of its flagship Creative Cloud has reached a saturation point. I'd argue, however, that Adobe's core strength lies among retail and individual users, whereas Docusign is better-known among enterprise clients. All told, investors would be wise to buy Docusign on any dips. 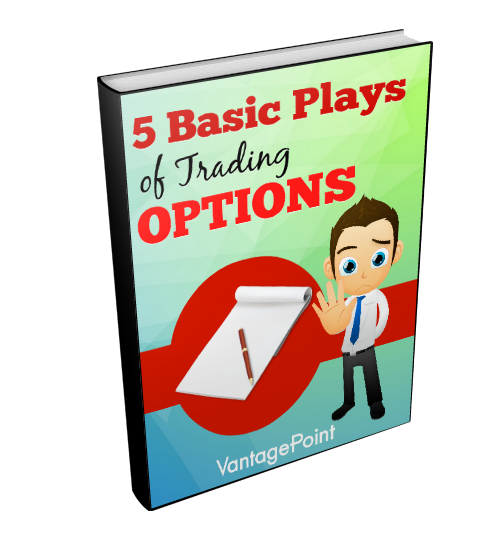 This is a technology stock to bet on for the long haul.